Please don’t spend anymore money on this mess. I was promised something was going to happen by a psychic and today she just told me something total opposite. I’ve tried many of them. You’re going to have to go outside the box. Google bestpsychicmediums.com. Now those are some real, jaw dropping accurate individuals. These people tell you what you want to hear and that’s it. 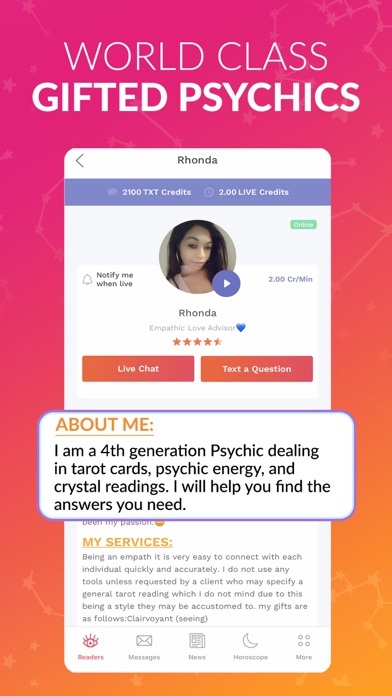 The psychics on the bestpsychic mediums are extremely gifted. They are kind of pricey but you do get what you pay for. Idk if it’s maybe just me? But I see a lot of good reviews. Look, 90% of them were spot on about my past which made it seem like what they said about my future would come true. None of anything that they said actually came true. I have spoken to so many psychics and idk nothing they said came true. I guess going to them for advice about the past or present is fine but I wouldn’t get your hopes up about what they say about the future. Trust me. It’s more like some of them are giving advice instead of a reading. 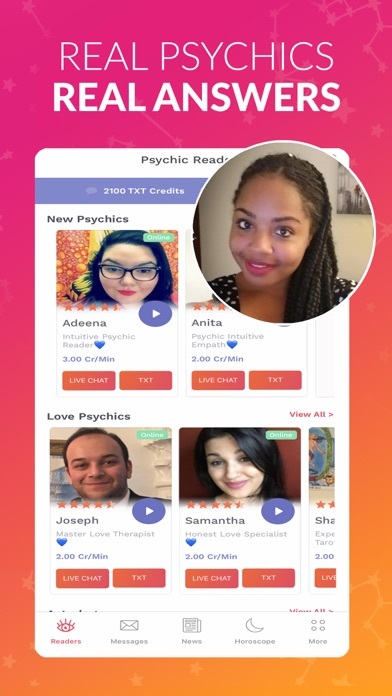 I love this app and Julie is by far one of the best advisors she is so kind and compassionate as well as right on point with her readings. Whatever you do, don’t go to Ken! Ken expects five star reviews for every read and if you don’t give him five stars ( I gave him two four stars) he tells you to go elsewhere and then has the audacity to insult you, the customer who already paid for the service prior to reviewing, with condescending, mansplaining, narcissist comments dripping with fake pleadings for “understanding his reasons”. For each rude response (of which there were three not including the original two) I gave him 1 star. To which he balked that I was now bringing his ratings down! I’ve asked for transparency and integrity with reviews. It seems to me, whatever a customer reviews, whether good or bad, it should be shown on that readers page to show the true ability of their “gift” and their attitudes. 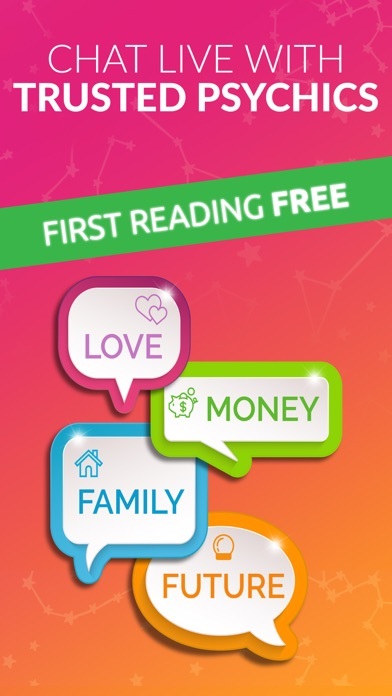 I’ve given plenty of fives and there are deserving and talented awesome readers in this app. However, this experience was uncalled for and unwarranted. I sincerely hope all reviews are shown without editing or choosing which ones you want shown and which ones you don’t want shown. I shouldn’t be treated with disrespect and refused service just because I didn’t give the highest rating. To be the best, you have to prove it with fact and accuracy. 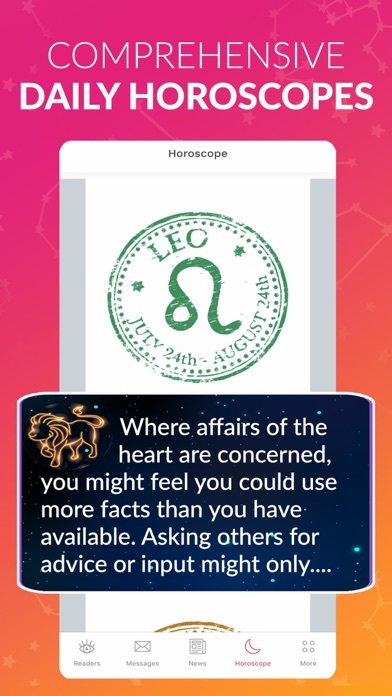 The psychics on the app are very informative and honest. They tell you the good and bad and what you may need to do in order to change a few things. 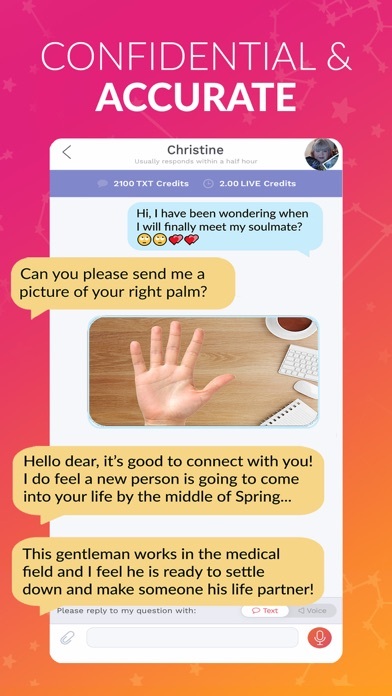 The future is based off your choices so you could choose to listen to them or just keep their advice in mind :) I recommend Amber, Jessica J, and Bridgette as they are very straightforward and give long replies. I have been dealing with a loss for nearly a year. This team has helped me stay strong and hopeful and put the pieces in place. In times where I wanted to give up hope they gave me reason to believe. When I thought things could get no worse they gave me gracious insight. Of course, not everything they have given me has come to fruition. I’ve learned that life affects energy, Hope, attitude- it’s all tied together. They have given me peace of mind. It’s not always been what I wanted to hear. There are some advisors on here I would never recommend, but to each his own. Joy, Tommy, Julie and a few others are my favourites. Worth the money, and far cheaper than therapy.